A US-based animal rights group says it will protest to a Hamas-run TV channel over a programme, showing animals being abused at a zoo in the Gaza Strip. 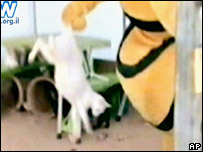 The group, Peta, criticised al-Aqsa TV for the children's show in which an actor was swinging cats around by their tails and throwing stones at lions. The show's host said afterwards that children should not behave like this. The show was criticised in June for featuring a character in a Mickey Mouse suit, denouncing Israel and the US. The character was later shown being beaten to death by an actor who played an Israeli agent. The episode about the Gaza zoo featured in the al-Aqsa TV children's programme - Tomorrow's Pioneers - last week. In it, an actor dressed as a bee was swinging cats around by their tails and also throwing stones at lions in their cages. The episode was reportedly aimed at teaching children not to abuse animals. But it drew strong criticism from Peta (People for the Ethical Treatment of Animals) after it was posted on YouTube video-sharing website by Palestinian Media Watch group. "It's shocking and sickening," Peta's Martin Mersereau told Reuters news agency. "Any lessons meant to be contained in this segment are almost certainly lost on most children, who are more likely to imitate people they see treating animals cruelly rather than understand this behaviour is wrong," he said. So far there have been no comments from al-Aqsa TV officials.